In what has become standard SPOC style, we road our bikes out of Vancouver around 11PM for Karl’s parent’s house in Deep Cove where we stayed up till 2AM watching Kubrick’s ‘A Clock Work Orange’ and drinking their beer. 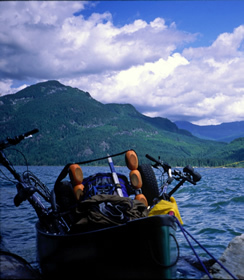 By noon the next day we had rigged the canoe and trailer to one of our bicycles, eaten several fresh baked donuts, and launched ourselves into the scenic Indian Arm. Full story in the Alpine Club of Canada Journal on shelves this June OR consider investing in the ACC Journal as a searchable DVD.